NASA managers Monday directed engineers to press ahead with work to repair four small cracks in three structural ribs, or stringers, in the shuttle Discovery's external tank that were discovered during X-ray inspections after Christmas. 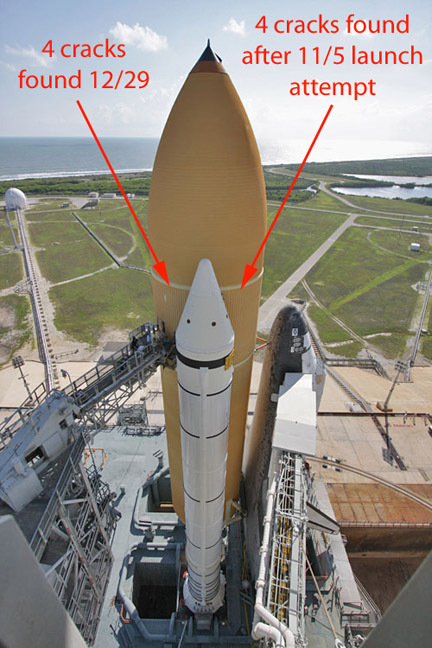 They also decided to add stiffeners to 34 other stringers to either side of the tank's massive booster attachment thrust panels that carry most of the load during launch. Another meeting is planned for Thursday to discuss installing so called "radius-block" stiffeners to the tops of the remaining 69 stock stringers that form the familiar ribbed wall of the intertank that separates the external tank's oxygen and hydrogen sections. Attached over the anchors of the existing stringers, the radius-block doublers, along with repairs already made to the five stringers with cracks, would make the structure less susceptible to temperature-induced flexing when the tank is loaded with supercold liquid oxygen that can result in stress-relief fractures. "That's an 'if' right now," a NASA official said of the additional stiffeners. "But I wouldn't be surprised if they came out of (the meeting) Thursday and said let's just do it. There's still going to be some uncertainty with these stringers and this modification removes some of that uncertainty." If that decision is made, it is unlikely NASA could complete the work, repair the tank's foam insulation and get Discovery back out to the launch pad in time to support a launch attempt during the next available window, which opens Feb. 3 and closes Feb. 10. Work to beef up all 108 stringers at the top of the intertank almost certainly would delay Discovery's launch on a space station resupply mission to the next available window, which opens Feb. 27 and closes in early March. Under that scenario, the next flight in the sequence, a mission by the shuttle Endeavour to deliver a $2 billion physics experiment to the International Space Station, likely would slip from around April 1 to around April 28, sources say. But no scheduling decisions have been made. The crack issue cropped up Nov. 5 in the wake of a launch scrub caused by a gaseous hydrogen leak in an external tank vent line. While monitoring the tank, engineers noticed a long crack in the insulation over a stringer on the left side of the shuttle near a flange that supports the liquid oxygen tank. When the foam was removed, four cracks in two adjacent stringers were found. The cracks were repaired by splicing in fresh stringer sections and installing doublers to add additional strength. At the same time, NASA launched an investigation into the potential causes and effects of temperature-induced cracks in the stringers and ordered tests designed to verify the structural integrity of the giant tank. Shuttle managers also ordered a full-scale fueling test, pumping more than a half-million gallons of oxygen and hydrogen rocket fuel into the tank Dec. 17 to precisely measure thermal gradients and the stresses acting on the stringers as the oxygen tank and its support hardware contract in ultra-low temperatures. That has the effect of bending the tops of the stringers inward. But the tank was designed to withstand those thermal effects and engineers have not yet found a single "root cause" to explain the eight cracks discovered to date. Tests are underway to deliberately over-stress stringers under laboratory conditions to map out failure modes and get a better understanding of the tank's structural integrity and its ability to withstand fueling and launch loads. The testing also is expected to show whether the radius-block modification, a proven method of repairing cracks that develop during the tank's assembly, will provide the strength needed to clear Discovery for launch in the absence of a known root cause. The four cracks discovered after Christmas will be repaired the same way the original four were fixed, by splicing in undamaged stringer sections and attaching doublers. The radius-block modification calls for removing the rivets holding the upper sections of stringers in place, installing the stiffeners to either side of each stringer and then re-installing the rivets. 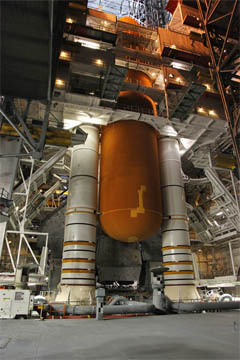 The external tank scheduled for use with Endeavour is an older model that was damaged during Hurricane Katrina and later upgraded to include post-Columbia safety improvements. That tank, ET-122, was built using different materials that do not have a history of cracks.